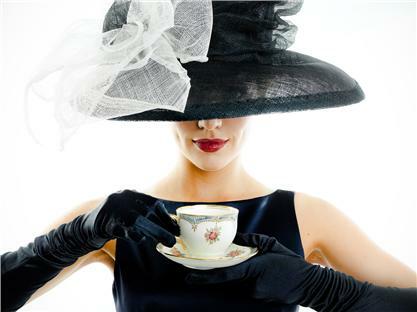 Whether you are a tea fan or not, I am a firm believer that every lady should experience a proper afternoon tea! The ambiance, service and the yummy treats are just a few of the wonderful things that are a part of afternoon tea and truly has something for everyone. There needn’t be a particular occasion to go to afternoon tea, the special occasion should be exposing yourself to a wonderful and delicious tradition! 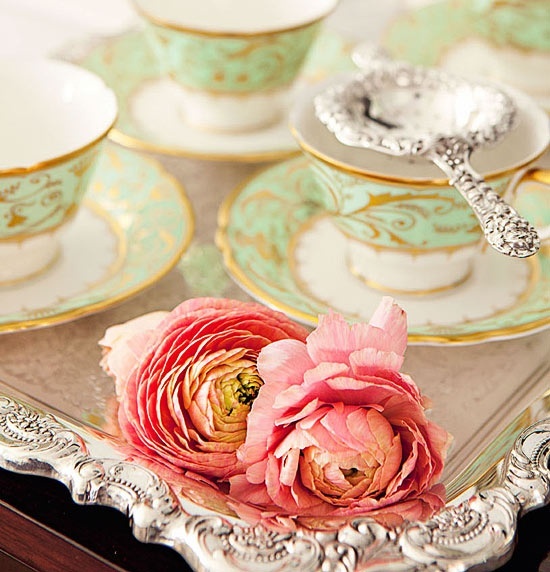 Yes, afternoon tea can be a bit on the pricy side, but that is why it is a special TREAT. 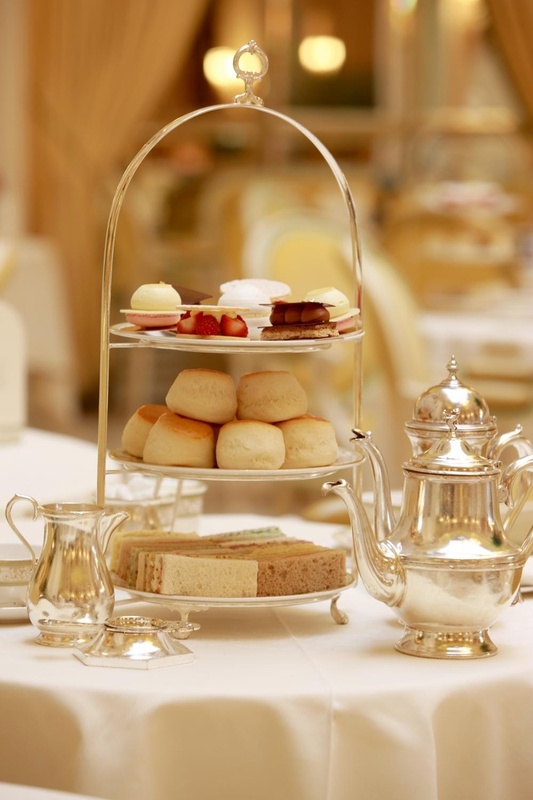 In addition, most places have varied levels of afternoon tea which can accommodate your budget. That being said, lets delve into the nitty gritty of afternoon tea! Afternoon tea began its rise in popularity in mid-19th century England when most meals were taken twice a day; breakfast and dinner. 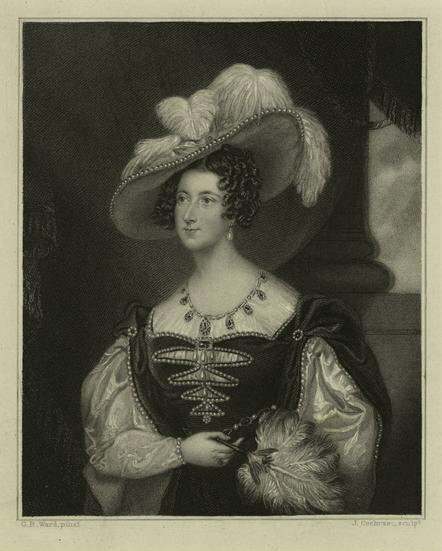 It is said that Anna, 7th Duchess of Bedford commented on having a “sinking feeling” in the middle of the day and as a result would often have tea and small sandwiches as a private snack. The Duchess then began inviting other ladies to dine with her, turning the private ritual into a social event! The practice began to gain popularity and was mimicked by many other upperclass ladies at the time. Later, the practice would become a normalized occasion when Queen Victoria engaged in the ritual and turned afternoon tea into a daily event. So, what exactly does a delicious afternoon tea entail? Usually served on a beautiful, tiered silver platter, tea participants will receive a selection of small (finger) sandwiches, scones with clotted cream and preserves and a selection of cakes and pastries. The scones are served warm with clotted cream (sometimes referred to as Devonshire cream) and strawberry or raspberry preserves. To eat the scone properly, cut in half and layer the preserves and then the cream. There is truly no specific order to the cream or preserves as it has been traditionally applied both ways, but I personally find the preserves then cream application to be less messy! A selection of tea will also be presented. Each guest will receive their own pot of tea at the beginning of the meal. For a bit of clarification, as there are many types of tea which can be confusing to any respectable lady. “Low Tea” is the common term referring to “Afternoon Tea” as this tea was served at lower tables while the guests lounged on plush couches. This tea was served to more upperclass guests and consists of the sandwich, scone and pastry mix. 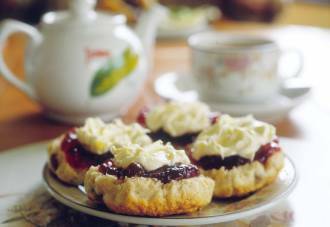 “Cream Tea” consists of solely scones, clotted cream, preserves and tea. “Champagne Tea” consists of the “Afternoon Tea” menu but includes a glass of nice champagne. Now off you go to show your new-found tea knowledge to all your lady friends! For today’s successful lady on-the-go, there is often not enough time to spend on getting ready for the day. 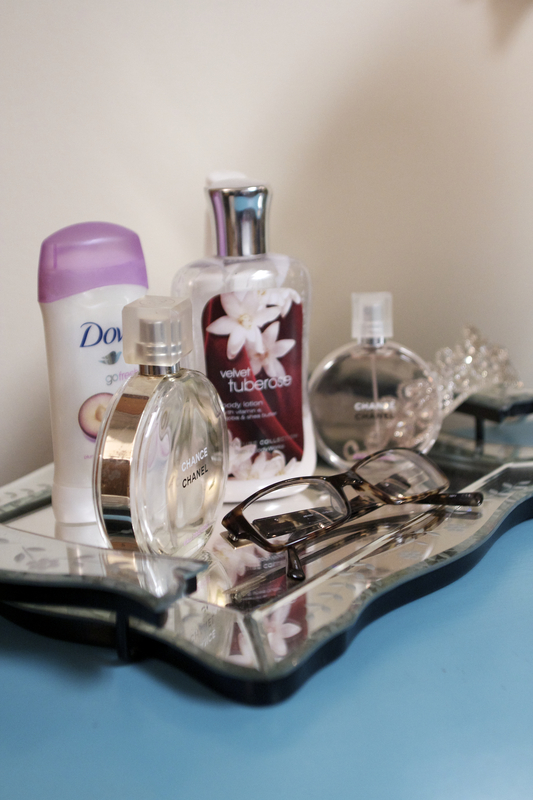 The last thing on your mind may be moisturizing and popping in some pearl studs, but by creating a pretty and easily accessible display of your basic primping items can help cut down on time and make you feel more ready for the day. Organization and minimalism is key when picking the essentials for your everyday routine. These should be the items you cannot leave the house without using. 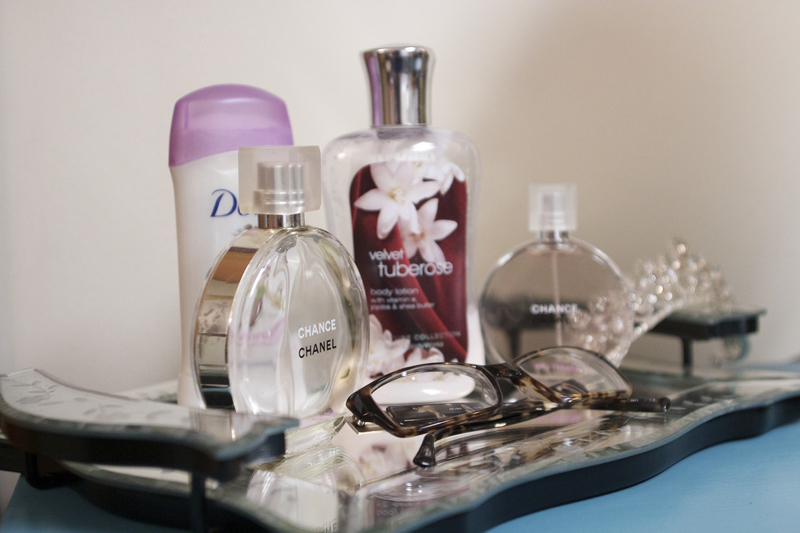 Things such as lotion, deodorant, moisturizer, perfume, vitamins/medication, and lipgloss/stick are great examples. After gathering these items, displaying them in an attractive and organized manner is key! The first step is finding a tray which can fit these items. Don’t pick a large tray simply to stuff everything you own onto. Select one which is small enough to encourage you to keep your items organized but large enough to hold the essentials. Stores such as Target, T.J. Maxx, and Marshalls often have a wide array of trays for affordable prices. If you pay more than $20 for a tray, you’ve paid too much… don’t be fooled, you’re a smart lady! Once you have found your tray, arrange your items by height; large and tall items in the back with small and short items in the from. This allows you to see all of your items and not forget to use one when rushing out the door in the morning. 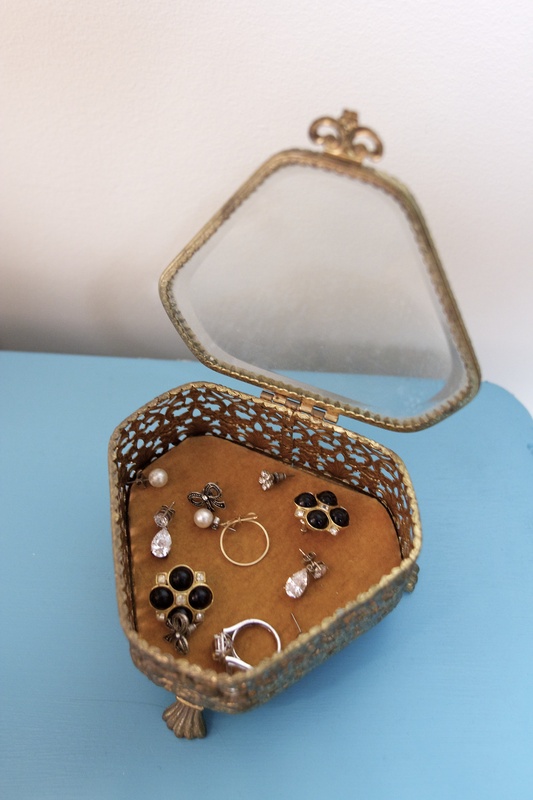 Additionally, I like to have a little container to hold a few pieces of jewelry. 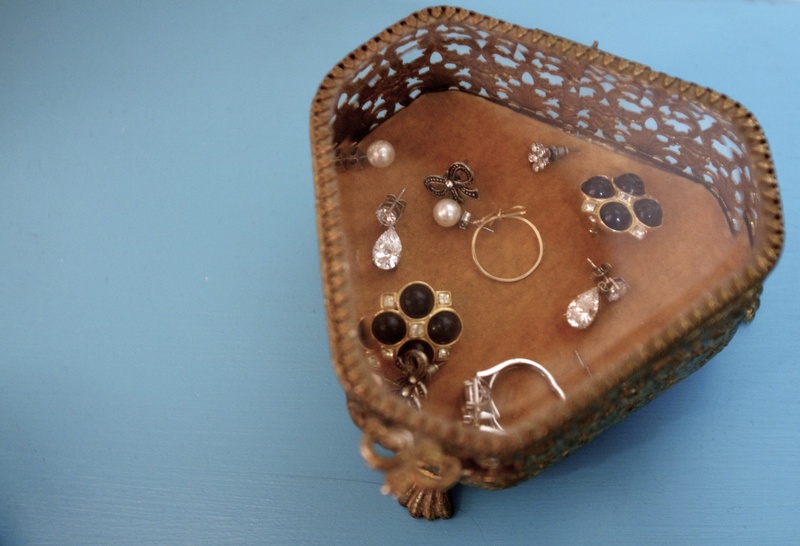 Some earrings and rings in gold and silver that are easy to slip on and go with any outfit are perfect. I find the cutest containers at thrift markets and barn sales but stores such as the ones listed above will have some as well! Now you never have an excuse to leave the house feeling unprepared to rule the day! A beautiful bouquet of flowers is a remedy to many things. For a bad day, a drab room, or even a last minute gift, a well arranged bouquet can bring a little brightness into anyone’s life. So, onto arranging that beautiful bouquet, whether given to you or not, a lady should know how to make those flowers look as pretty as possible. 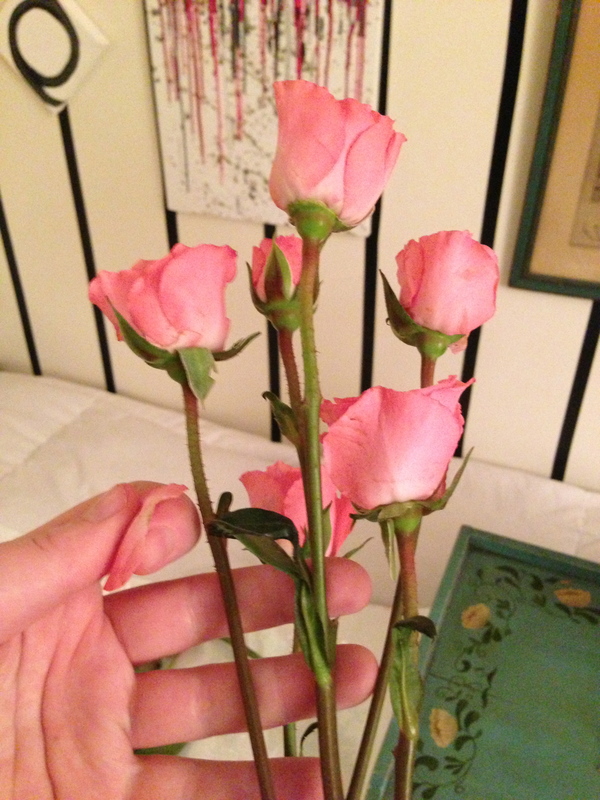 I decided to treat myself today to a beautiful bunch of pink mini roses from my favorite flower stand right outside Macy’s in Boston. The prices are the best in the city as I got my full and healthy bunch for $8! Simply because flowers are pricy does not mean they are better or will last longer than a cheaper bunch. 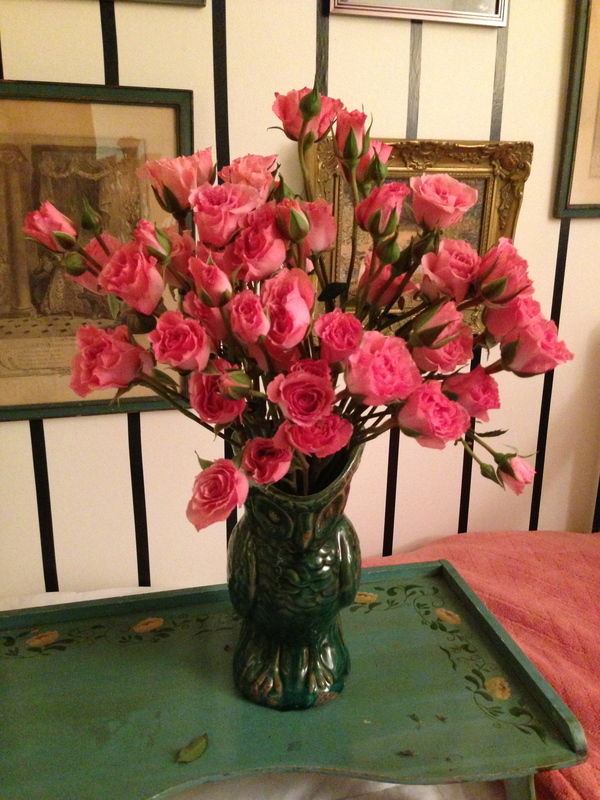 When choosing your flowers, look for partial and budding flowers within the arrangement. A bright color without browning on the edges is also very important in addition to thick stems without breakage. 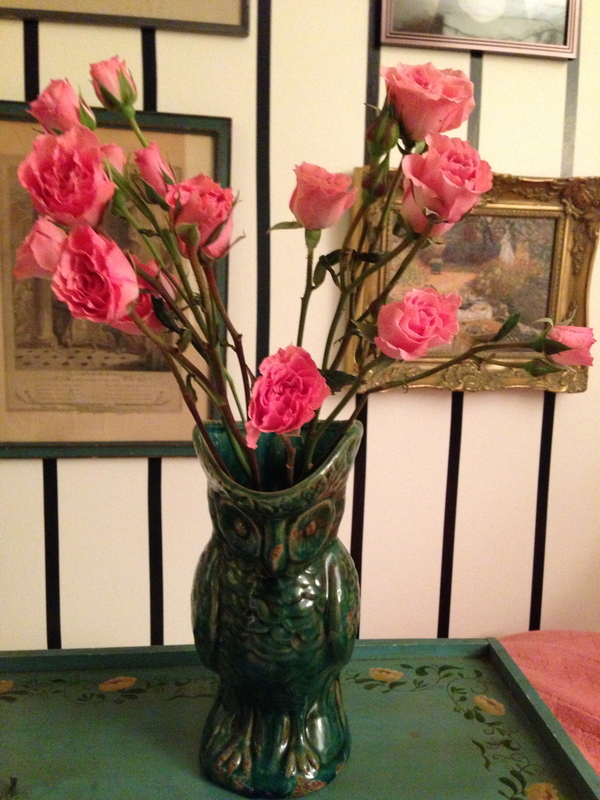 After I selected my bunch, I marched off to my favorite bargain spot, T.J. Maxx to get a new vase. 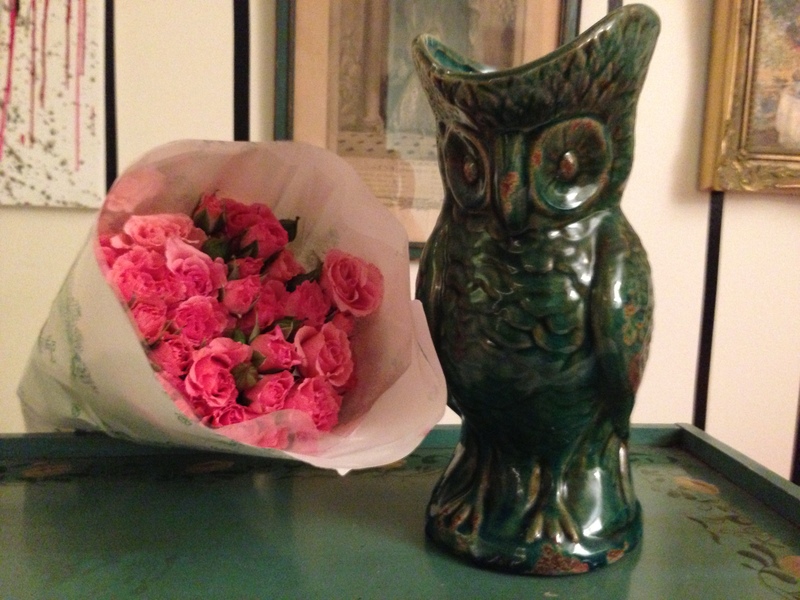 I found a tall, turquoise owl pitcher that I knew would perfectly compliment my pink flowers and it was only $6.99! Finding vases that aren’t conventionally used for flowers is also a fun task and can create unique and personalized displays or gifts. 1) To begin, fill your vase 1/3 full with lukewarm water. Yes, lukewarm! The warmer temperature help flowers to absorb the water faster and bloom sooner. 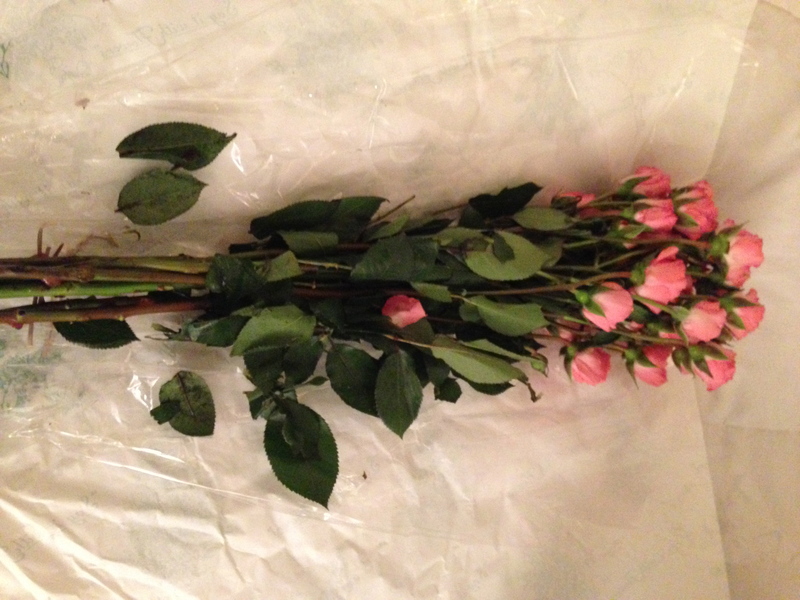 2) Unwrap your flowers and use the paper or plastic you receive them in as your workspace. This makes for easy cleanup later. 3) Cut through the rubber bands, tape, plastic. 4) Begin to take off the leaves. I believe bouquets look cleaner without fillers or leaves so I usually leave them out and take the leaves off. The result is always sophisticated and classic. 5) Take one stem and hold it up to the vase as you decide how tall you want the bouquet to be. Always take off LESS than you wish. You can always cut off more if the stem is too tall. Do this for each stem as not all stems are initially cut the same length. 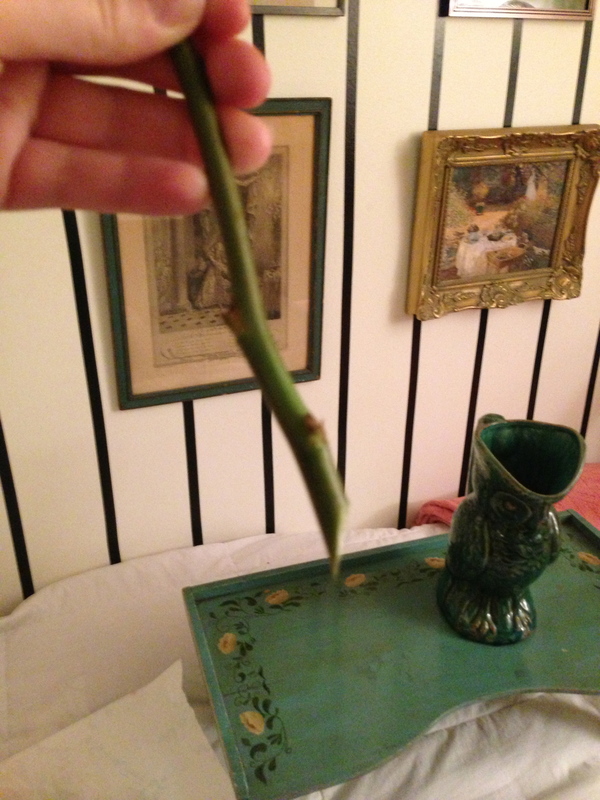 6) When cutting the stem, cut them at about a 45 degree angle. Cutting the stem at an angle creates more surface area for the stem to absorb water, creating a healthier flower. 7) After cutting the stem at an angle, take off any outer petals which look bruised or loose from the rest of the flower. The outer petals protect the flower and therefore often can be a bit worn. They can be removed for this reason. 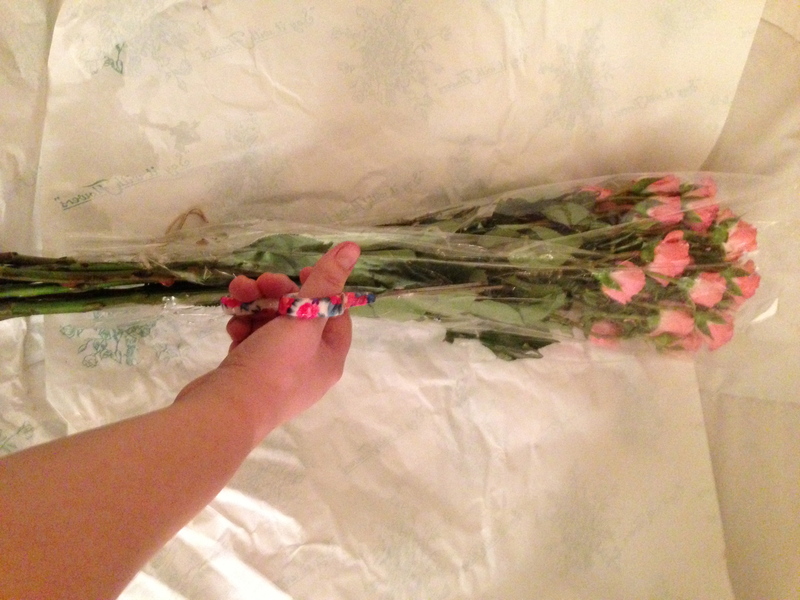 8) Place the flowers into the vase one by one. I usually start in the back and work my way around the vase to create a more symmetrical look. This way, you can also play with the arrangement of the flowers to form the shape you wish. Remember, its okay for the arrangement to not be perfect. Cut some stems longer than others for varied height in the middle of the arrangement. Flowers are natural, so their arrangement should look so too! 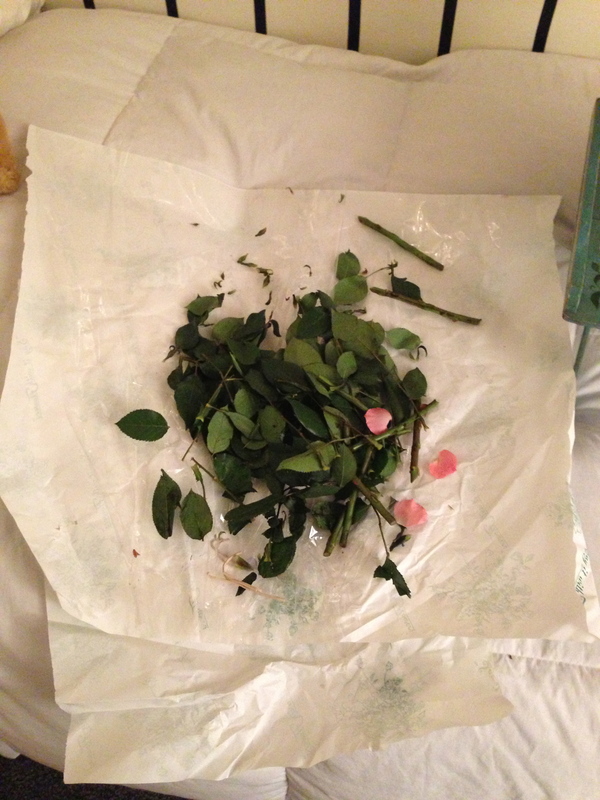 9) Wrap up your work space with all the stem bits, leaves, petals and plastic and throw away… It’s that easy! 10) Et voilà! You have created a beautiful bouquet! Just imagine the smile they will bring when you or a friend walks into a room. One of the most important traits a young lady can have is the ability to communicate in an efficient, charming and clear manner. In today’s age, letter writing is seen as an ancient form of communication, but the positive connotations of handwritten letters does not go unnoticed by anyone. Handwritten letters take time and thought and are much more valued than a misspelled text or sloppy email. If a young lady wishes to become successful and well thought of, it is important for her to learn the correct format of letter writing and the proper way to address an envelope. Leave quick correspondences that are time sensitive and business oriented to modern day communication and use handwritten letters as symbols of care and appreciation. Thank you notes for gifts, visits and interviews are a necessity as they show appreciation for the other person’s time spent with you. These letters are also an ideal format for reconnecting with relatives and friends or simply letting those who you love know you are thinking about them. 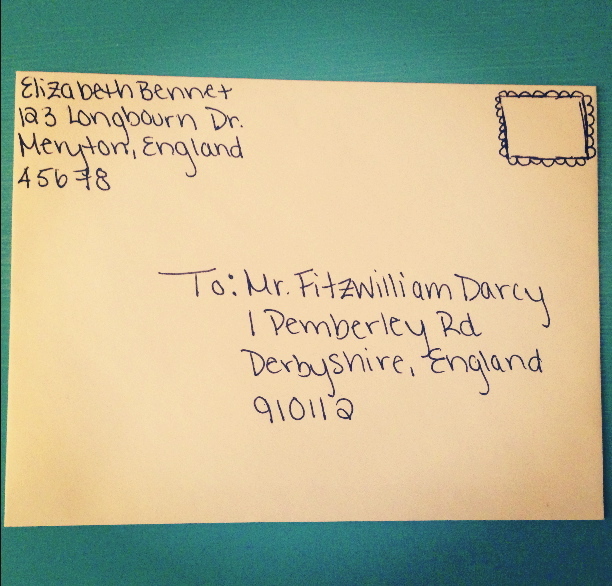 Either way, the power of a well-written letter is essential to the 21st century woman. Below we will discuss how to address a formal and an informal letter. 1) A full sheet of paper should always be used, unlined and of good quality. 2) The top right hand section of the letter should include the sender’s address or your address. 3) A few spaces below the beginning of the return address should begin the inside address or the address you are sending the letter to, in the top left hand section of the letter. 4) A space below the corresponding address is where the date the letter is written on will be included. It can be either on the right or left hand side of the paper. 5) Address the letter. If you know the name of the individual, address them due to their status or qualifications (Mr, Mrs, Miss, Dr, Prof, etc.) The abbreviation Ms. is used for both married and single women if you are unsure of her status. 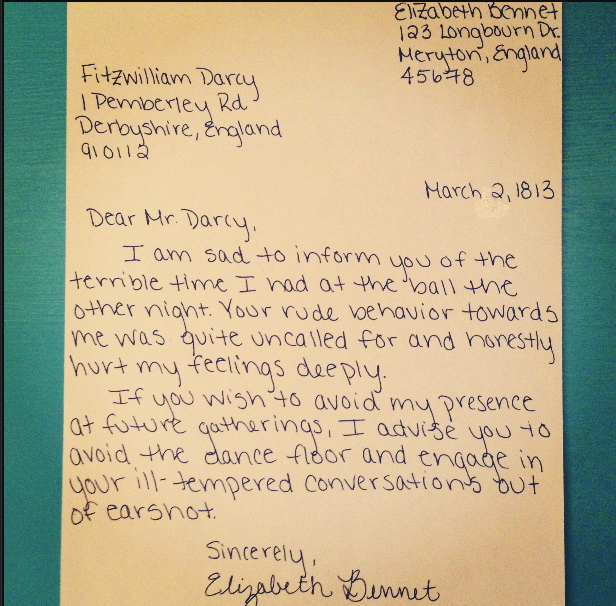 Place “Dear” before each addressing of the individual. If you do not know the individual, “Dear Sir or Madam” or “To Whom It May Concern” is appropriate. 6) Write the body of your letter. Double check for spelling and grammar. The more direct and pithy you are, the better. If you write any errors, do not cross them out and continue, you should start over again from the beginning. 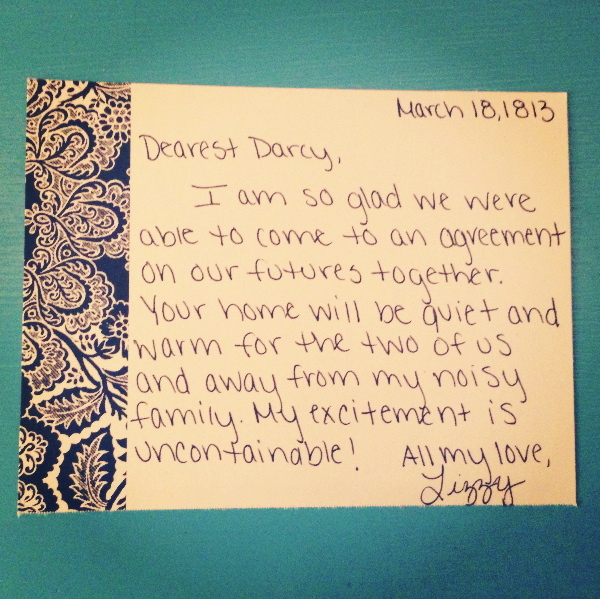 7) Sign the letter based on the relationship you feel you have with the corresponding individual. Sincerely, Best Wishes, Best, and Graciously are always acceptable. 8) When folding the letter, fold it into thirds. If you fold incorrectly, do not try to refold, as it looks messy and unprofessional. 1) An informal letter can be written on either a one-page piece of unlined paper of any quality or a pre-made stationary card. 2) The letter does not need to include the sender’s address or the inside address. 3) A date should be included in either the top left or right hand corner. 4) Addressing an individual in an informal letter can still include (Mr, Mrs, Miss, Dr, or Prof,) but can also include first names and nicknames if appropriate. “Dear” or “Dearest” can be placed in front. 5) Write the body of the letter. Grammar and spelling are still to remain intact but the sentence structure is much looser than in a formal letter. 6) Conclude the letter with whatever signature seems appropriate. This may include: love, all my love, thanks, many thanks, etc. Finally, when filling out the outside envelope for sending, the sender’s address should be listed in the top left hand corner of the envelope with the inside address or corresponding address in the middle of the envelope. The stamp should be placed in the top right hand corner.